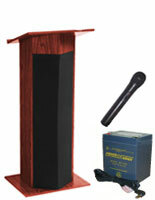 These podiums with wired microphone are made of strong wood and feature an attractive mahogany finish. 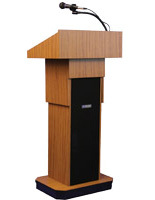 Each speaker's stand measures 22" wide and 46" tall. 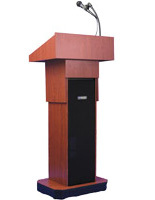 The podiums with microphone come with a 9' long cable and an additional hands-free lapel with a 10' cord. 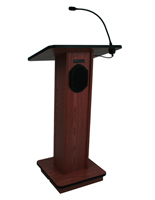 The mahogany lecterns are great for churches, offices and schools for presenting to crowds. The wood podiums indlude a control panel for managing bass, treble, volume and more. The speaker's stands also make it easy to connect to other sound systems via cable. 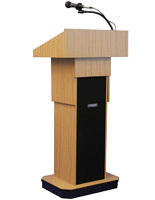 This podium has a built-in wireless ready system. 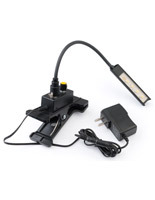 The amplifier has a line-in and line-out to connect to any in house sound system as well. 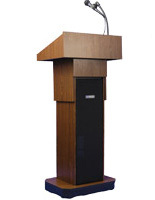 This podium, such as lectern or pulpit, comes with a stop watch, wired mic with a 9' cable and a hands free lapel with a 10' cable. Some Assembly Required! 32.0" x 46.0" x 17.0"